Many believe that one of the great things about sailing a Laser is how simple it is. There”s very little you can change or tweak about the boat – you just get in and go racing. One of the few things you can add to aid your performance is a Laser Wind Indicator. Sure, adding a wind indicator won”t turn heads like a new Laser Sail, new Line, new blocks, or like Chris does when he goes out for a night on the town dressed up as “Christine”. But, a wind indicator will alert you to deviations in the wind when they”re not always apparent and that can mean valuable points across the finish line. With that in mind, I took a look at, and tested, the four most popular mast mounted wind indicators for the Laser to see how they stack up against each other. I also spoke with some local Laser gurus to get their tips on getting the most out of your wind indicator. I also spoke with Ryan Minth, creator of the C-Vane, about what sets his wind indicator apart from the others and how he uses it. The wind indicators I looked at were, from the top of the picture to the bottom, the Davis Black Max, the C-Vane, the Kingfisher & the Little Hawk Mark II. At first glance, all four of the wind indicators share some similarities. They all mount to the mast with a wrap around bracket and share a similar shape in terms of how the wind vane sticks out from the mast. The C-Vane does offer something new in terms of design with its dual arms – the other three have the same single L shaped arm. For testing purposes I mounted them all to Aaron”s lower mast section and evaluated them in terms of responsiveness, weight, cost, mounting bracket construction and durability. Admittedly the last two were fairly subjective but I”ve tried to provide a lot of pictures so you can draw your own conclusions as well. As usual a disclaimer about the non-scientificness of our testing procedure applies here – I”ve done my best to evaluate these fairly but I”m only human so errors are possible and even likely. And so with that, on with the results…. As you see from our comparison, the Little Hawk MKII comes in as the lightest and the Black Max is the cheapest. Responsiveness was measured in two ways: with the wind indicator mounted right-side up (arm on the bottom) and right-side down (with the arm on top to protect the indicator from being flicked into the water by a passing mainsheet). Right-side up the Kingfisher and Little Hawk MKII faired well, but when they were upside down the C-Vane was clearly the favorite. The C-Vane was still right-side up though, as its design naturally sheds sheets, adding a little wrinkle to the results. To determine responsiveness I mounted all the wind indicators to the mast and tied it up inside the shop. Unfortunately, the purchase request I submitted for a wind tunnel with our Accounting Department was still “pending”, so we had to make do with a fan. I turned on the fan and slowly walked towards the mast, noting which indicators began to respond first. I rotated their positions on the mast and performed the test over a total of 4 times. I then repeated the tests with the wind indicators mounted upside down – except for the C-Vane which I left right side up because, once again, it naturally protects the vane from outside sheets. 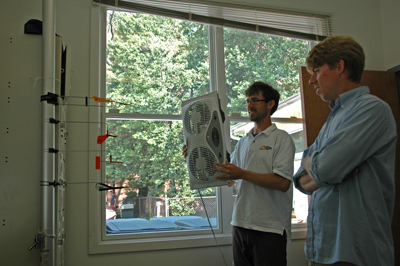 Rob “supervising” in the wind indicator testing lab. After performing all the tests, I added up the scores for each wind indicator and determined rankings with the lowest total being ranked 1st. In parentheses next to the rankings on the chart above you can see the total score which gives you an idea how where they all compare to each. The C-Vane was clearly dominant in the upside down test with the rest sharing fairly similar results. Right side up both the C-Vane and the Black Max were a step behind the Hawk and Kingfisher. The wind indicators started to move at around 0.5 knots of wind and all of them had responded by the time the wind speed was just 1.4 knots, so this wasn’t exactly a high wind velocity test. I expect that responsiveness becomes less relevant the windier it gets so if you often sail where it’s windy it may not be much of a consideration for you. The argument about which way to mount your wind indicator is older than time itself (aka, Steve in Customer Service). Much like putting jam or butter on your toast, this is a matter of personal preference. As evidenced by our tests, right side up gives you increased responsiveness – this makes a lot of sense because that’s how these wind indicators were built to operate. The loss of responsiveness when the indicator is upside down seems to directly correlate to the construction of the vane itself (discussed in greated detail with each indicator below) and you”ll need to decide whether decreased performance in light air is worth the decreased possession of the indicator itself. If you really are worried about losing your indicator, mounting it upside down is probably going to be a better, more cost effective option for you than just avoiding other boats and starting in the 3rd row. Then again, Chris likes to start 3rd row all the time, and he doesn”t sail with a wind indicator at all. Anyways, here”s a closer look at each of the four wind indicators with some brief conclusions about each. Vane: The Little Hawk MKII vane mounts on a pin shaped bearing and is held on with a small black plastic bracket that snaps into the base of the vane. One downside of this system is that I expect it”s difficult to make these plastic pieces exact enough that the weight rests on the bearing and not the plastic bracket. Since I don’t have x-ray vision I can’t tell if it’s really resting on the pin bearing inside the vane or not so your guess is as good as mine. 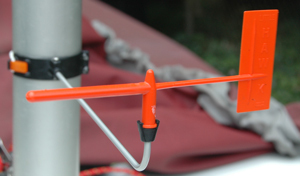 Mounting Bracket: The Hawk mount has a plastic bracket with a loop of shock cord that wraps around the back of the mast and hooks onto the other side of the bracket. You can see in the pictures above the small orange plastic tab that hooks it together(the middle picture is the “locked” position). The two black tabs are there to prevent the tab from flipping off through accidental contact. The Good: The Little Hawk MKII is the lightest wind indicator of the four at only 1.0 oz and it”s also fairly inexpensive. It”s also pretty responsive, finishing a close 2nd in our right side up test. The Bad: I think the Hawk has the worst mounting bracket of the group – the elastic attachment is the least secure of all the brackets and the material of the bracket itself is made of a fairly lightweight plastic. Overall it does not feel as secure or as durable as the other indicators. It also has a lot of wobble on the mast because the bracket is fairly narrow – if you tap on the wind vane it will bounce up and down more than the others. The Conclusions: The Little Hawk MKII is a very lightweight, low cost wind indicator that is pretty responsive. You pay a price for the weight savings (which honestly are negligible) in terms of durability though. Overall I think this is probably my least favorite of the group. Vane: The Davis Black Max vane spins on plastic bearings both above and below the vane. When right side up it sides on three small points for lower friction. This vane is the only one that comes already assembled and the top cap that holds it on feels very secure. Mounting Bracket: The bracket on the Black Max is fairly sturdy plastic with some extra vertical tabs to keep it more secure on the mast. The shock cord clip hooks into a J-shaped loop in the bracket and the shock cord itself has an adjustable toggle. It allows you to tighten the shock cord to compensate for elongation with age or if you just want the bracket to be tighter. The Good: The Black Max, the least expensive of the lot, has a solid, secure bracket that can be tightened down. The wind vane has a bearing on both the top and bottom making it nearly as effective upside down as it is right side up. The Black Max also comes assembled in a plastic tube that you can store the vane in to prevent damage from sitting in the pocket of a blade bag. According to Davis the tube is “unbreakable” – honestly, it says that on the package. While I think that’s perhaps an overstatement it is really useful. 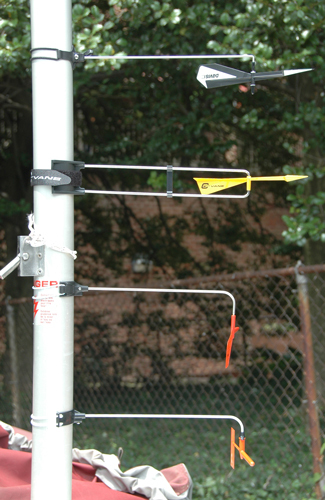 The Bad: The Black Max is not the most responsive wind vane we tested. It was the least responsive of the group in the right side up position and while it’s fairly comparable to the others upside down it still finished last in that test as well. The Conclusions: The Black Max is a great value – it is pretty durable and it while it’s not very responsive it is about par with everything but the C-Vane if you mount it upside down. The storage tube is actually a very useful accessory since the indicators can be damaged in your blade bag if you’re not careful. All in all I think it’s a solid vane for a great price especially if you live in a windy area where the lack of responsiveness won”t matter as much. Vane: The C-Vane is obviously unique in many respects. The vane itself rests between the two ends of the metal support. There is a black plastic clip that connects the top and bottom supports and keeps them at the right width. 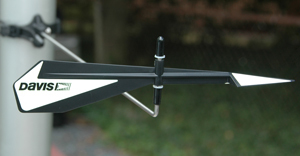 I spoke with C-Vane creator Ryan Minth and he said the proper position for the clip is just aft of the vane – that way it keeps the distance at the tip at the proper 2.36 mm. The vane then sits in the gap between the metal rods and it actually spins on a point that”s molded inside the plastic vane. Ryan says this creates a very low friction vane because there”s no need for a plastic clip or retaining device that adds friction. The vane itself is also individually replaceable. The C-Vane bracket is noticeably more substantial than the other indicators in our group. The bracket is about twice as tall as the others and is held on with a Velcro strap. The bracket itself is made of a flexible rubber material that is an upgrade from the original C-Vane bracket material. I”ve spoken with several people who had the bracket break on the original design (it used to be made of stiffer plastic that was somewhat brittle) but the more flexible design now offered is much more durable. The Velcro strap is available as a replacement part. The Good: The C-Vane is extremely durable – the bracket is very strong and the Velcro should hold up better than the shock cord on the other designs. The availability of replacement parts is also nice. The upside down responsiveness test shows that if you”re worried about mainsheets hooking your indicator the C-Vane is the clear choice. Ryan told me that in the next model they are looking to refine the balance of the vane and use a more durable vane material developed by golf tee manufacturers – I can”t hit a driver to save my life so I don”t see a lot of tees but it sounds like a promising improvement. The Bad: The C-Vane is the most expensive wind indicator as well as the heaviest. The extra ounce or two is hardly worth crying over though since that”s probably worth a couple spoonfuls of water in the cockpit. This vane wasn”t the most responsive compared to the other wind indicators in the right side up test. The Conclusions: The C-Vane is my recommendation for the best all around wind indicator. It”s only real downsides are being slightly less responsive and more expensive. The expense is mitigated by the availability of replacement parts and I think once there”s any real amount of wind the responsiveness isn”t as much of a factor. 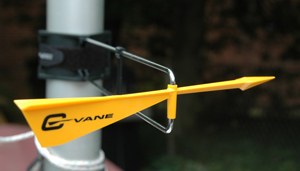 The real stand out quality of the C-Vane is it”s durability – the mounting bracket is far superior to the rest. Particularly if you sail in an area where it”s generally blowing more than 10 knots the C-Vane is definitely going to be the way to go. If you”re tired of buying new indicators because you keep losing them off the boat this is also probably a good way to go. Ok, so once I get a wind indicator how do I use it? I talked with local Laser sailor Luke who works for Farr Yacht Design so I figure he knows a thing or two about wind and making boats go fast (he also happens to be very fast in the Laser). I asked Luke about how he uses his wind indicator and he offered a couple useful suggestions. Both Ryan Minth and Luke mount their wind indicators so that they”re right in the line of sight between you and the waves in front of the boat. This can enable you to trim your sail without having to look up so you can stay focused on working the waves. Luke also suggested that one of the best uses of the wind indicator is downwind both to determine whether you are by the lee or not as well as keep track of small shifts. I find that it”s easy to miss out on a shift and be sailing 5-10 degrees to high or low of by the lee because the feel of the boat remains similar. Having a wind indicator can help you catch those shifts and react faster to them. It”s also useful in light conditions upwind when Luke says the tell tales don”t respond as quickly as the wind indicator does to small shifts. I think having a wind indicator on the Laser is definitely a benefit and will help you improve your sailing if you don”t already have one. If you do have one inevitably it will need replacement and I think the C-Vane is a great choice particularly because of it”s durability. The Kingfisher is a solid choice as well if responsiveness is paramount to you, but really only if you mount it right side up. As always if you have any comments, questions or suggestions leave us a comment or send us an email. Great job James. Please do more of these comparative reviews on the blog. This is extremely valuable. After reading this I would order a C-Vane from you. But I already have one! Thanks anyway. I bought a C-Vane and the velcro strap broke at the stitching almost immediately; so I question your "durability" evaluation a bit. That being said, I'm glad to find that the strap is available separately, so I'll be ordering one of those. I've been using duct tape to hold it on ever since the thing broke. I can't find that strap as a separately available item on your website. Got a part number or link? The C-Vane spare parts are now up on the website and can be found here. The most useful time to use one of these is when its light winds and very shifty. Thats when you need lightweight and responsive. The Little Hawk Mk2 wins in these areas and that is what makes it the worlds biggest selling and most popular Gooseneck Wind Indicator. betwaite pheasant feather is absolutely the best wind indicator – provided you sail in enough water so you don't destroy it when you turtle. Nice write up. I found this very informative and helpful in my purchase. Thank you. If you want to predict or indicate the wind, I suggest you consider that tool. I think it can help in a lot of ways.